Heat 1 tbsp of oil on medium heat. Fry 2 ginger slices until fragrant. Fry till cooked through to a golden brown. Add 1.5 litres of water and boil on high heat for 15 to 20 mins till the broth turns milky white. Skim off scum while boiling. Strain the soup. Discard the bones. Portion soup into 200ml portions. These can be frozen for up to 1 month. Wash and rinse rice a few times. Put rinsed rice into a pot. 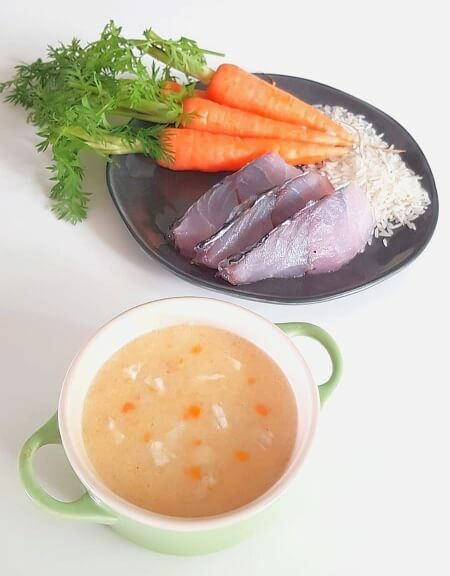 Add in 400ml fish stock and 50g diced carrots. Bring to boil and lower heat to simmer. Simmer for 45 minutes or until rice breaks down completely. Add in 50g Barramundi Fish Fillet. Cook for further 5 mins. Let it cool down and use a blender to puree it. 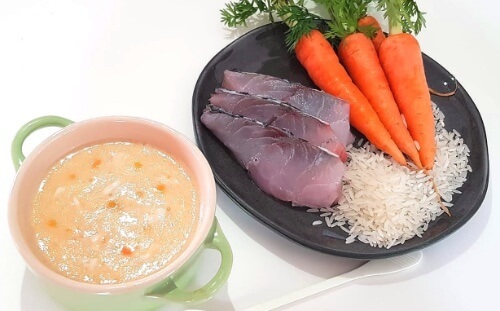 Adjust porridge with fish stock to achieve desired consistency. Add baby's favourite vegetables for taste if desired.